Temple Emanuel was started in the late 1940s when several members of an area Conservative congregation felt that Reform Judaism more accurately fit their beliefs and lifestyles. The new group met in members’ homes and other locations before the Temple building was completed in 1959. Over the years, the temple has looked to eight rabbis for spiritual leadership: Alvin Reines, Sefton Temkin, Dov Taylor, Daniel Breslauer, Everett Gendler, Neil Kominsky, Dawn Rose, and Robin Sparr. These rabbis have represented a spectrum of traditional and progressive perspectives and styles. 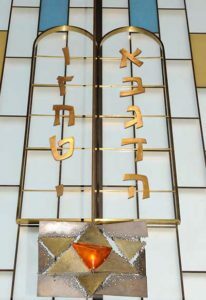 Our previous building was home to the world’s first solar-powered Eternal Light (Ner Tamid), installed in 1978 by Rabbi Everett Gendler, who led the congregation from 1971 to 1995. Gendler, known as “the father of Jewish environmentalism,” also played a key role in involving Jewish leaders in the civil rights movement of the 1960s. Rabbi Gendler marched alongside and was arrested with Martin Luther King, Jr. in 1962. Although his colleague, Abraham Joshua Heschel, is the rabbi best known as a friend to Dr. King, it was Rabbi Gendler, once Heschel’s student, who urged Heschel to join the historic march from Selma to Montgomery in 1965. Rabbi Gendler also chaired the March 1968 national rabbinical convention at which Dr. King was an invited speaker, 10 days before Dr. King’s death. Rabbi Robin Sparr joined TEMV in 2015, continuing our tradition of choosing our leadership wisely. She was the High Holy Days Cantor at TEMV for several years before her ordination as a rabbi, and brings warmth, energy, music and creativity into the sanctuary and classroom. We look forward to the future under her guidance and wisdom. One of our Torah scrolls comes to us from the town of Sobeslav in the Czech Republic. It belonged to a congregation that ceased to exist after the Holocaust. The history of the Czech Torah was unknown until TEMV member Linda Gilmore did extensive research into its origin. We rededicated the Torah on May 25, 2012. The Torah is part of the Memorial Scrolls Trust.